Download the NVIDIA GeForce 310.33 Beta 32/64-bit driver. This is a beta driver from the new GeForce R310 family of drivers. Nvidia has published a fresh beta driver of its own, offering up to 15% more performance on certain hardware and software setups as well as new and updated profiles. Compared to the GeForce 306.89 WHQL released earlier this month, the new 310.33 beta offers 2% to 7.5% more frames in Batman: Arkham City, Civilization V, Dirt 3, Dragon Age 2, The Chronicles of Riddick: Assault on Dark Athena, and The Elder Scrolls V: Skyrim when running on a GTX 660 with very high to maximum settings Nvidia touts similar gains on the GTX 680, which runs 3.2% to 10.9% better in many of the aforementioned titles as well as Deus Ex: Human Revolution, F1 2011 and StarCraft II. Includes support for applications built using CUDA 5 or earlier version of the CUDA Toolkit. 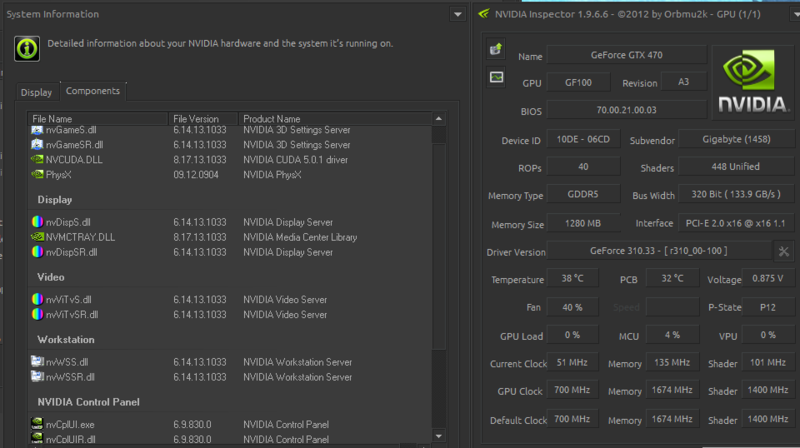 Installs PhysX System Software v9.12.0904. Wonder if these fix Borderlands 2 at all? Can't wait to hear reports back if they're any good ? Oh nice. Seems to also come with a new version of PhysX. Also, at the site searching for any 6/7 series card does not show these drivers so I guess they did pull DX9 card support. Not sure how true that is, maybe the inf can be modded to support them or maybe it already does. EDIT: Yeah looks like the INF by default supports "only" back to the 8k series. That is good. The more old hardware support that is dropped, the better support for current hardware. 6% increase in Arkham City will probably translate to at least around 6% boost in BL2. On the plus side, you have a month before the game comes out on PC, I would say a new profile should be available by then. New PhysX was also installed. Is this with the benchmark or gameplay? How is your framerate when gliding around the city? Are you being CPU bottlenecked in those situations? Does the game run smoother though? Is the outside gliding stutter fixed? Bottlenecked on an i7 980x??? I hardly think so, not even at stock. Not with Skyrim. GW2 Id say yes, even with one GPU you need to OC your CPU. Also, I run enough graphic enhancing mods (for textures, lightning and ENB) to get GPU dependent. I did not play the game. The bench still had a couple stutters - at the end of the spark showers and the end of the ice attack scenes. I suspect the game still suffers at times. Using mods will only limit the gains even more. Did you guys install on-top or remove old, clean and then fresh install? Just install on top, if you run into a problem, install fresh. Of course not. But it's a downclocked 670. Same architecture. And there is literally 0% improvement really where should be. If I use no graphic mods I will certainly get CPU bottlenecked at some point, and I SHOULD see an improvement over the previous driver in Skyrim.